LAS VEGAS, NV--(Marketwired - Dec 3, 2013) - AUTODESK UNIVERSITY BOOTH 2518 - Sefaira, the leader in software for high performance building design, today announced that its energy analysis platform now supports Autodesk® Revit models, integrating Sefaira further into the Building Information Modeling (BIM) eco-system. Sefaira for Revit enables architects to perform energy analysis on Revit models starting with the first design iterations and throughout their design process. By expanding its support to include one of the most popular BIM platforms, Sefaira further reinforces its commitment to empower architects to incorporate energy analysis into early stage building design. Sefaira for Revit is the first performance analysis tool built for architects that delivers intuitive comparison of design options and parametric analysis to BIM. Sefaira's web app provides a wealth of performance and sustainability information in the form of integrated whole-building analysis of energy use, water use, carbon emissions, thermal comfort, and renewable energy. Its cloud-based analysis engine generates results in seconds with as few as three inputs -- a massing, building location and building type -- while providing the rapid feedback that architects need to drive performance-based decision-making. With its user-friendly interface, Sefaira helps architects develop an intuition for building performance, allowing them to respond to performance requirements creatively. Heather Gayle Holdridge from Lake Flato Architects, who said: "Our firm is committed to using building information modeling on all projects so we can integrate sustainable systems with construction detailing and administration. It is important to have building performance simulation integrated into this process as well. Decisions related to energy and daylighting are critical and this kind of information will be more accessible if they are integrated into the tools we already effectively utilize." Paul de Ruiter from Architectenbureau Paul de Ruiter in the Netherlands said: "We recently licensed Sefaira's software to use as our analysis tool for sustainable performance. It allows us to make the right decisions during the first stages of the preliminary design, which ultimately will reduce the energy cost for the end users of the buildings. As an active BIM user, the integration with Revit was one of the key reasons we chose Sefaira. Sefaira makes the BIM process even more efficient whilst making better performing buildings." Sefaira CEO Mads Jensen said, "Autodesk Revit has a wider user base than perhaps any other BIM platform in the industry, and because high performance building design holds the promise to create a truly sustainable built environment, we are excited to work with Autodesk and their many customers to implement best practice and leading edge software for sustainable design." 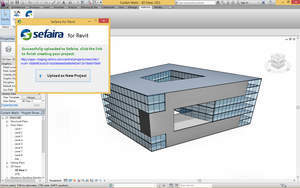 Sefaira for Revit is now available as part of Sefaira subscriptions. Sefaira's team will be available for demos at Autodesk University at booth 2518. Founded in 2009, Sefaira develops cloud-based software to help architects design high performing buildings. Using Sefaira, architects and other building designers can analyze and compare multiple building strategies within a fraction of the time and cost previously required. This includes defining, quantifying, and optimizing the energy, water, carbon and financial benefits of relevant design strategies. Sefaira won the 2013 Sustainability Leaders Innovation Systems & Software Award and the 2013 ENDS Green Economy Green Data Award. It has been named to the 2013 Global Cleantech 100, the 2013 Red Herring Top 100 Global, the 2013 European Business Award's "They Could Be Giants," and the 2012 Going Green Global Top 200 private companies. The company also won Gold at the 2013 Ecosummit award in Berlin as well as the "Green Building Innovation of the Year" award at London's Ecobuild in 2011. Sefaira has offices in London and New York. Revit is a registered trademark of Autodesk Inc. Sefaira is a registered trademark of Sefaira Ltd. All rights reserved. Sefaira users can now upload Revit models directly into the Sefaira Web App, making performance analysis of Revit models easier than ever before.